This fall Hurricane Sandy famously knocked out power in lower Manhattan. A friend, I'll call her Natalie, was stranded in her cold, dark apartment for days. Most New Yorkers hunkered down with gritty reserve. Yet when I finally reached Natalie, she was bright and cheery. She spoke not about the lack of water or frigid nights but about the romance of living by candlelight and the kindness of neighbors. This issue's lead article on subconscious mental habits reminded me of Natalie. Our brain's biases can predispose us to view the world through either a positive filter—as with Natalie—or a negative one, as psychologist Elaine Fox explains in “The Essence of Optimism,” on page 22. 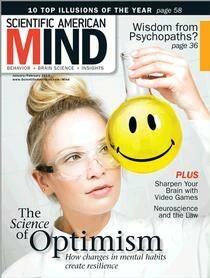 An emerging therapy promises to help tune depressive or anxious minds to a happier channel. Our brain's unreliable interpretations can sometimes lead to grave consequences, especially in the courtroom. Time can distort eyewitness testimony, for example, and a leading interrogation can extract a false confession. Psychologist Scott O. Lilienfeld and attorney Robert Byron explore the sources of error that can push the gavel toward an unsound ruling in “Your Brain on Trial.” Turn to page 44. The behavioral sciences can also learn lessons from criminals snared by the law. In “Wisdom from Psychopaths?” on page 36, psychologist Kevin Dutton interviews some of the scariest men in prison to discern how, in moderation, the common characteristics of psychopaths—such as charm, focus and ruthlessness—can spell success in various professions in the outside world. If garnering insights from convicts seems counterintuitive, wait until you read about the mental benefits of first-person shooter games. Of course, concerns remain about how exposure to simulated violence affects players. But, as you will learn in journalist Lydia Denworth's “Brain-Changing Games,” on page 28, recent studies show that these games improve visual acuity, spatial reasoning and decision making. Perhaps the optimists are right after all: every cloud has a silver lining.